Graduating from Cal Berkley in 1992 Steven set out to pursue his musical career. From 1992 to 1994 Steven worked as a session vocalist at the renowned Fantasy Studios in Berkley, California. Shortly after this time Steven found himself fronting a popular Hard Rock group from the San Francisco Bay area by the name of Legion where he shared the stage with such names as Gregg Allman, Peter Criss, Jefferson Starship and White Snake and many more. During the late nineties Steven found himself on the other side of the Pacific in Australia where he was a cast member in the on stage musical Soul Train, which was a Tribute to 60’s and 70’s R&B. Upon his return to the States, not being able to stay away from the stage for very long, Steven auditioned for and got the position as lead vocalist in a Casino show band called “Memphis Rising”. Memphis Rising was an R&B review celebrating the music of Stacks Records, this show was quite successful performing in Las Vegas for several years. This is where the Timeless Wonder concept was born. Timeless Wonder is a remarkable tribute that celebrates the career of one of America’s musical icons, Stevie Wonder.The Timeless Wonder show is guaranteed to delight audiences of all ages and cultures. Steven’s portrayal of Stevie Wonder is nothing short of remarkable! 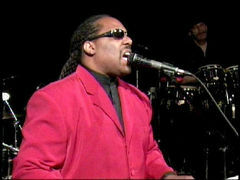 It is amazing to witness Steven as Stevie Wonder for you will surely get lost in the resemblance. Will the real Stevie Wonder Please Stand Up!